Last week I had two uncles. This week I have one. 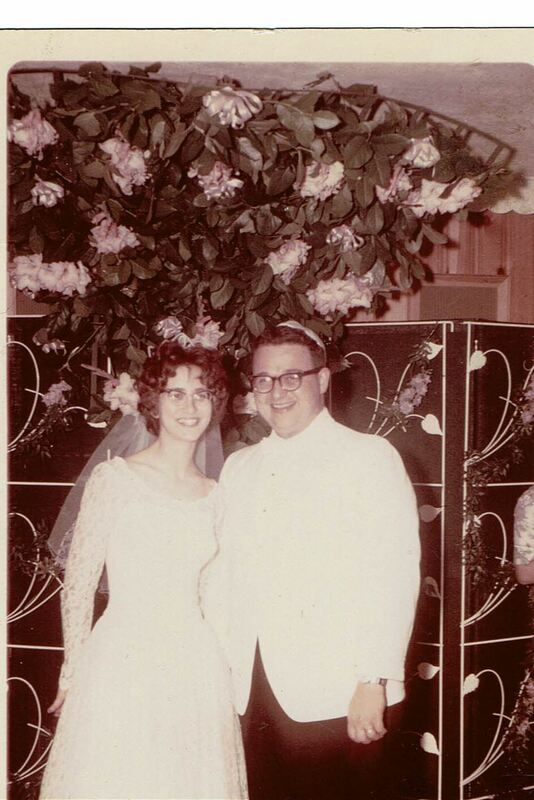 My Uncle Jerry lived in Stockton (with my mom's sister, my Aunt Sue), and it has been a long time since we were together. 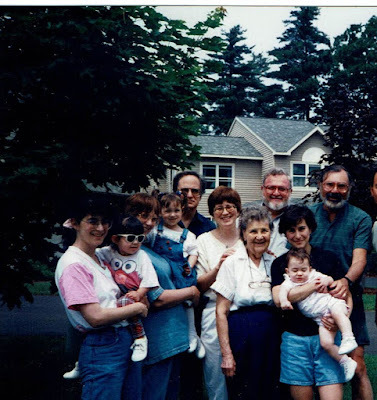 But I have fond memories of the entire family gathering at my grandmother's house in Schenectady, where Jerry would lecture and discuss and argue and joke with the rest of us, and let out that huge honking laugh of his. 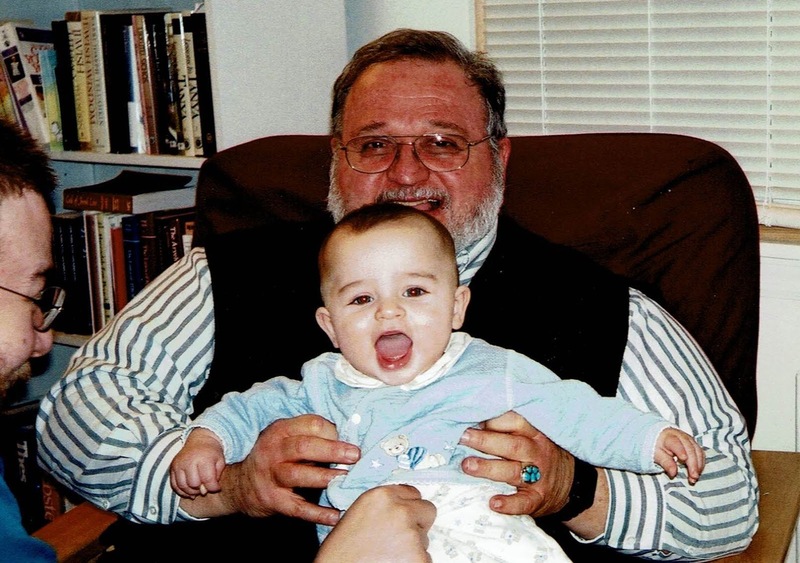 I was brought up Jewish, and Jerry was one of the few members of our family who stayed with the faith. 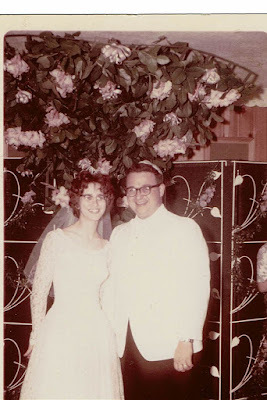 So this is for him; the Kaddish, the Jewish prayer for the dead. 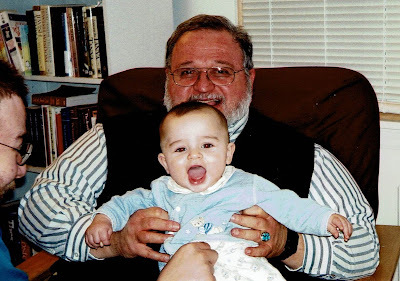 My world is a little smaller without you in it, Uncle Jerry. Rest in peace. speedily and soon. And let us say, amen. May God's great name be blessed always and forever. that is uttered in the world. And let us say, amen. be upon us and upon all Israel. And let us say, amen. Ba'agalah u'vizman karim v'imru, amein. Y'hey sh'mey rabah m'vorach le'alam u'le'almey almaya. Aleynu ve'al kol yisrael ve'imru, amen. It seems like I'm spending a lot of time these days dealing with bad news, and trying not to spend too much time ranting on Facebook and Twitter :-) So I'm happy to have a bunch of good things to talk about. So happy, I'm doing a giveaway to celebrate. Some of you may have seen some of this stuff on Facebook, but I'm rounding it all up here today. I have not one but TWO book cover reveals! 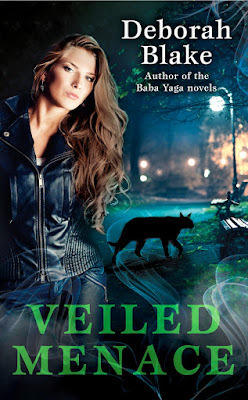 One from Berkley for VEILED MENACE, the second book in the Veiled Magic series, coming out on April 18th (less than two months away!) and up for preorder now. The second cover reveal is for my next Llewellyn book, coming out October 8th. A Year and a Day of Everyday Witchcraft is part devotional, part book of shadows, and all fun. Here's the blurb for that one (also available for preorder...just sayin'). Connect with your witchy self every day using small, easy, and fun practices. This book features quick and meaningful ways to integrate witchcraft into your daily life, inspiring you to take your magick to a new level whether you’re a beginning or experienced practitioner. 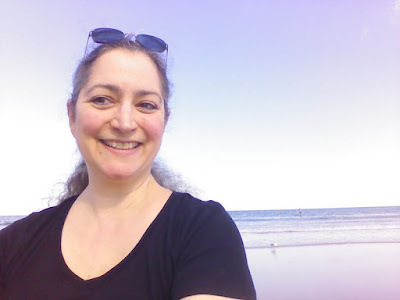 Deborah Blake guides you on a journey through the Wheel of the Year, providing witchy wisdom, affirmations, spells, questions to ponder, and much more. 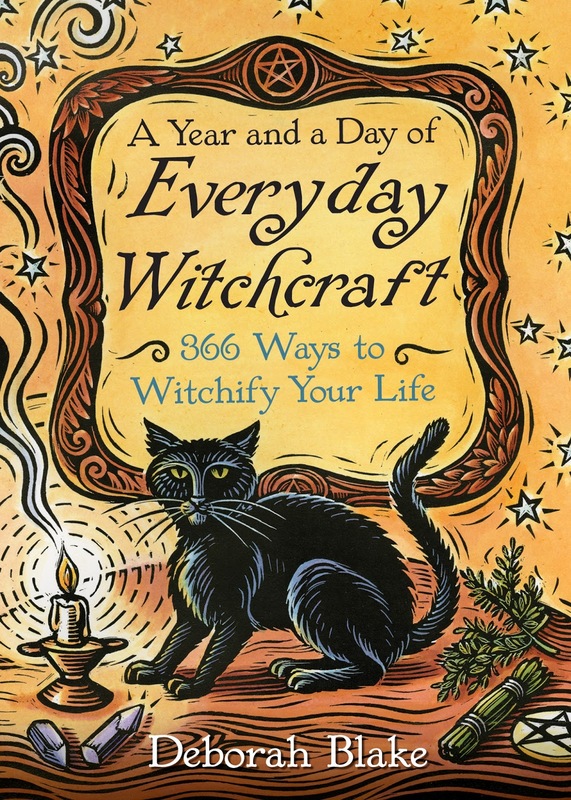 From connecting with nature to connecting with deities, A Year and a Day of Everyday Witchcraft explores a variety of modern Pagan practices to help you get more in touch with your personal path of witchcraft. That cat looks to me like he is about ready to get into some trouble...there's something a little dangerous in his eyes. Speaking of dangerous, DANGEROUSLY CHARMING is up for a couple of awards! How cool is that? The first Rider book is in the finals for "Favorite SF/Fantasy/Futuristic Romance at the Australian Romance Readers Awards (I love my Aussie readers!) and also as "Best Paranormal Romance of 2016" at RT Book Reviews (formerly Romantic Times). That second one is HUGE in the field of romance writing, and I am thrilled just to be nominated. 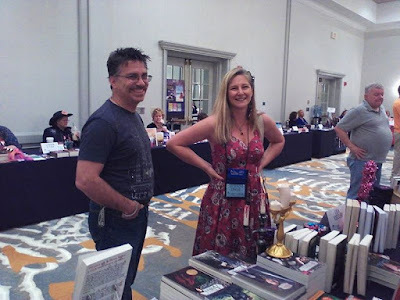 I've also decided that I'm going to go to the RWA National Convention in Orlando this July, and found out I'll be rooming with the fabulous Maria V. Snyder. So that's one more thing to look forward to. I hope I'll see a few of you there. Be sure to tell me if you're going. 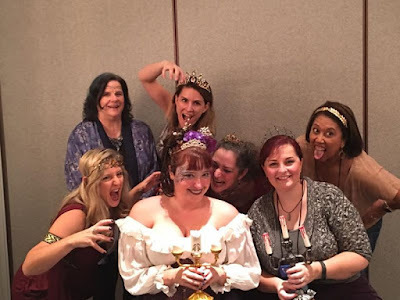 With VEILED MENACE out in less than two months, it is obviously time to start celebrating! Are you with me? I have a few VEILED MAGIC goodies left over, including a totebag, a notebook, and a couple of small things, like one of my favorite witch broom pens. As usual, all you have to do to enter is fill out the Rafflecopter form below. And yes, you get credit for things you have already done, like following the blog or following me on Twitter. Magic the Cat approves of this giveaway. So, when last we left our intrepid heroine, she was suffering through a warm Florida sunset on her way to dinner with fun companions. It's a hard knock life, I say. So...I'd been looking at the place we ended up going to dinner, since you could see the side of it from the hotel, but hadn't made it there last year. It was quite the experience! (I may have gotten 4-year-old-at-Disney excited. Just ask Lucienne. No, on the other hand, don't.) I present...Joe's Crab Shack (I highly recommend it if you happen to be in Daytona Beach). The view as you walk down the pier toward the restaurant. Inside. A very sensible suggestion. Which I followed, of course. I had a bib too. Our waiter created each of them individually. I forget what it said. I was distracted by the seafood boil pot Alethea shared. It was heaven! To make the evening even more amusing, about halfway through dinner all the waiters stopped what they were doing and went to the sides of the room, where they proceeded to do a synchronized dance. It was hysterical. In fact, the service, the food, and the atmosphere were stellar. I can't wait to go back next year, if I'm at the con. Dancing waiters for the win! We were all stuffed, so the five of us shared this insane S'mores dessert. Heaven. We might have had to be rolled back to the hotel. Friday night was also the dance party mixer, where Lucienne dragged me out onto the floor to dance a couple of times, gimpy knee and all. Lots of people dressed up as their favorite novel or movie characters. I loved these costumes so much, I dragged these two out into the hall so I could take their picture! Lucienne wore her goddess costume from the afternoon, but I just wore, you know, clothes. Which apparently meant I should be attacked by a dinosaur. Yeesh. Really, Lucienne? We can dress her up, but we can't take her out. And no, I have no idea where the dinosaur came from. Can you tell we were having fun? Thankfully, there are no pictures of my dancing. The bad knee did not add to my gracefulness, although it held up pretty well considering the insane amount of walking I did during the con. Saturday morning started with another beautiful sunrise. A girl could get used to this. The view from the 15th floor. Look, off in the distance, it's Joe's! 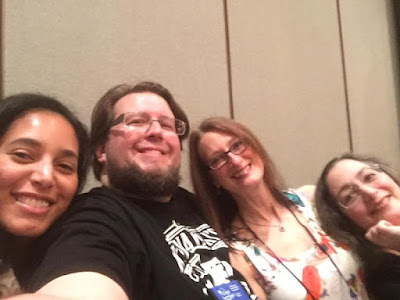 First thing that morning I took part in a fun panel called "Remaking Mythology," with Alethea Kontis, Asa Maria Bradley, Lucienne, Gail Z. Martin, and Eric Asher. Then I snuck out to the beach again for a while. Sigh. Bare, sandy toes! No snow! My happy feet. Saturday lunch was a fun event called "Lunch with an Author," where readers got to sit and chat with the author they signed up to dine with. Then there was the group book signing. Lisa Kessler and Princess Alethea looking adorable as usual. Lucienne's gorgeous and charming husband Peter Wheeler rode his motorcycle in for the day to join us. 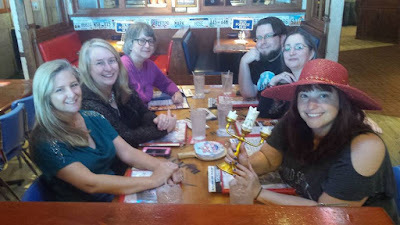 Afterward a bunch of us staggered back to Bubba Gump's to grab a late dinner (the book signing went until 7:30). Later that evening was Game Night, where authors hosted a table at which people could come and play a game with them. Lucienne brought Cards Against Humanity and we stayed up way too late having way too much fun. Sunday morning Lucienne and I did our (now traditional, apparently) Mythology Jeopardy game panel. So much fun! I think you might be seeing a theme here. Now you know why I went a second year and may well go back next year as well. SO MUCH FUN and all the good peoples! Which one of us is Alex Trebek? NOT ocean. Unless you count an ocean of snow. But also back this, which makes it all okay. Yay for great cat sitters! I'm not even sure the cats missed me. All in all, another great event(hotel renovations aside, and that was really just an annoyance). Jennifer Morris, who puts on the con, does an amazing job. If you can, I'd highly recommend going next year. I hope I get to do it again. Maybe I'll see you there! 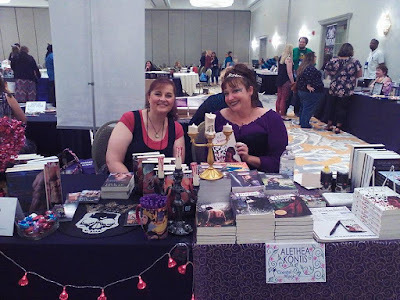 Labels: Alethea Kontis, book signings, Coastal Magic Convention, Eric Asher, food, fun! Lucienne Diver, Gail Martin, Graylin Fox, Jennifer Morris, Lisa Kessler, ocean! Although you have to admit, it's a pretty good reason. I left by bus on Wednesday afternoon, arriving in Schenectady in the early evening, where I had dinner with my sister Sarah and adorable niece Addy (they live there, along with my poor BIL who couldn't come along because he'd just had cataract surgery). After dinner they took me to the Colonie Barnes & Noble, where Addy gleefully showed me some of my books on the shelves! Seriously, isn't she adorable? Also, I love to see my books in the wild. I flew to Orlando in the morning, where Lucienne met me at the airport and we drove together the hour or so to get to the hotel at Daytona Beach. After we checked into our room, we went to this fun seafood restaurant called Bubba Gump's, based on the movie Forrest Gump. The food was delish! Thank goodness there are no calories in food eaten at a con. That's right, isn't it? 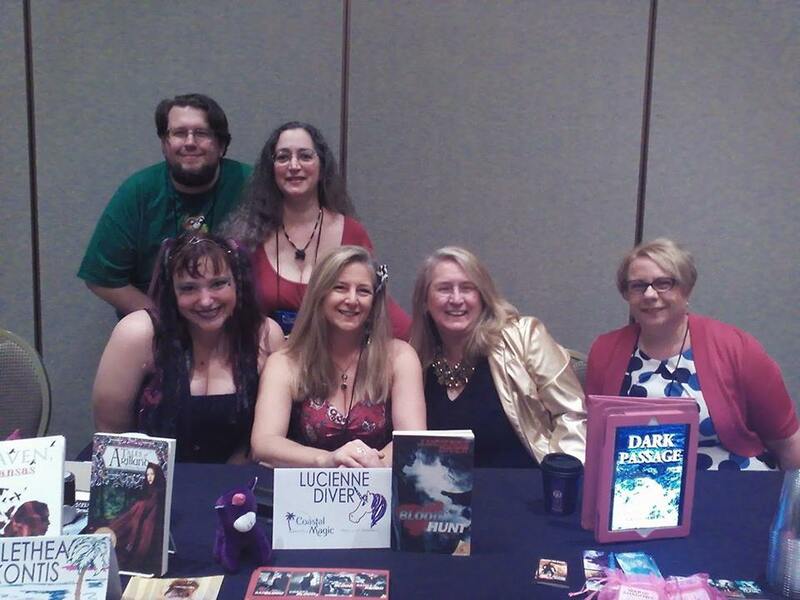 The lunch gang, including Lucienne, Eric Asher, Nancy Northcott, Gail Z. Martin, and Alethea Kontis. That evening, there was a fun author/blogger meet up, where some folks managed to find the elusive stuffed unicorns! This was the sunrise outside my window on Friday morning. Unfortunately, they were doing construction at the hotel, so on Thursday and Friday, the calming sound of the waves was interspersed with the not-so calming sound of circular saws... Still, ocean. 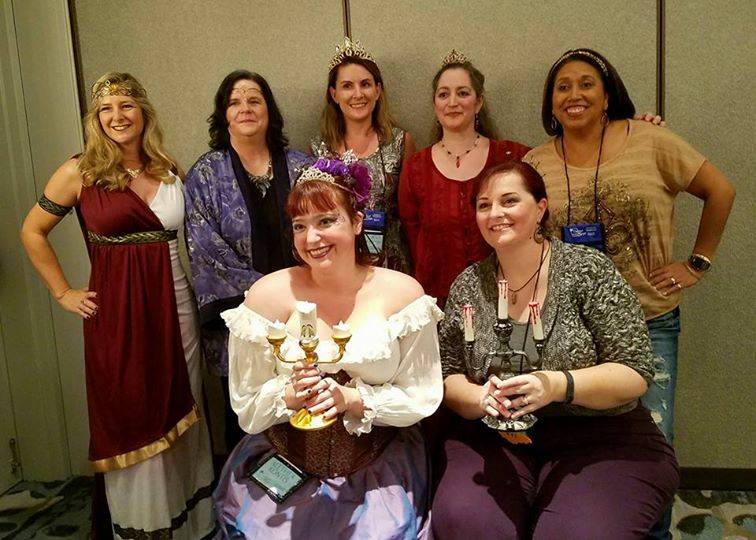 My first panel on Friday was a fun one--A Kind of Magic, where various authors discussed the use of magic in their books. The "Magic" gang: Chudney Thomas, Eric Asher, Larissa Ione, and me. A Katie Fforde book from across the pond, and look, a unicorn! 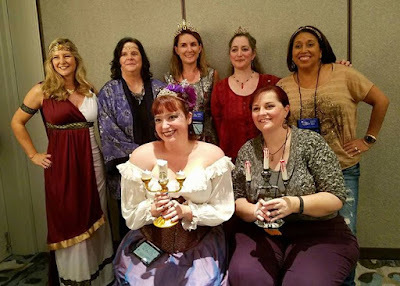 Goddess Lucienne, Princess Alethea, and me. The funny thing about this picture was that Alethea and Lisa Kessler, seated in the front, had no idea what was going on behind them. They didn't realize until we put the picture up on Facebook! The evening ended with a fabulous dinner and Lucienne dragging me out onto the dance floor at the Mixer/party, gimpy knee and all. But more about that in the next post. For now, have a look at the beautiful sunset we saw as we walked to dinner.